Lost teeth can affect many parts of your life including eating and speaking. They can also lower confidence and make you self-conscious. Unfortunately, the mental picture that many people have of dentures is not much better. 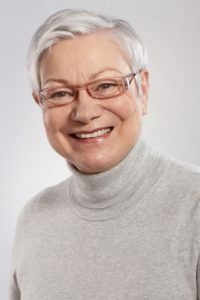 Often associated with bulky, fake-looking prosthetics that slide around the mouth, dentures may be avoided by people who see them only as a source of further embarrassment. Here to help you change your outlook toward dentures are your Reno dentists, Dr. William Wager and Dr. Brian Evans. They discuss the advances made in dentures over recent years and how they have added to comfort and limited embarrassment. Today’s dentures are significantly sleeker and lighter than the dentures of the past, making them more comfortable and less prone to slipping. Cosmetic advances have also made prosthetic teeth more and more lifelike. Today’s dental crowns blend almost seamlessly into a smile, and a full row of prosthetics made using the same processes can be just as convincing. Dentures can boost your self-esteem rather than detract from it. They can also make speaking and eating easier, especially when they fit properly. While fitting you with dentures, your Reno dentists, Dr. Wager and Dr. Evans, will examine your entire mouth to make sure the dentures fit properly. Once snugly in place, suction will hold them in position, and the risk of slipping will be minimal. However, if you are still not convinced about dentures, you may consider having your dentures supported with dental implants. Dental implants anchor restorations into the jawbone for a firm foundation. In the case of implant-supported dentures, teeth are supported by the jaw rather than the gums, for a restoration that feels natural. Patients also don’t have to worry about any slipping or embarrassment and may forget that they are wearing prosthetic teeth at all. Are you missing your teeth? Restore them with dentures. Schedule an appointment with your Reno dentists, Dr. Wager and Dr. Evans, today. Contact our 89502 dentist office at 775-829-7700. We are proud to serve patients in Reno, Sparks, Sun Valley, Spanish Springs, and surrounding communities.